Saturday at The Tobacco Hut found me enjoying a pipeful of McClelland's Wilderness in a tall Ascorti rusticated - it's a rich mélange of both Syrian and Cyprian Latakias, red Virginias, Orientals, and even some Yenidge, which is a smooth Turkish tobacco. Combined with Diet Mountain Dew and peanut butter pretzels, my palate was more than satisfied! Readers from last week's blog will know that Adrian arrived last week more than satisfied himself, which I reported dutifully in said blog. Apparently Adrian came in again during the week not entirely happy that his peccadilloes were broadcast to the blogosphere, for which I apologize. Well, not really. I mean, the man did burst into the store all atwitter about his triumphs. I did treat his "activities" with a modicum of discretion, I believe, and left it to the gentle reader to fill in the blanks, as it were. His absence this Saturday, however, was noted by many. We can only imagine what happened, or didn't, this weekend. Hope to see you all smiles next Saturday, Adrian! So we know that Adrian was a no-show on Saturday...who did make it? Here it is - big announcement - lots of fanfare - drumroll please...Scott R showed up after his long trip south from New York! Wait, wait. Time out. While it is true that he showed up, his visit was a short one. In fact, he called me in the morning whilst on his way to the Hut, but by the time I called him back twenty minutes later he was headed home. Apparently he had some business to attend to on the home front and he had to take off. He did pledge to make it next Saturday, so hopefully he can make it and we can catch up with the Knife Guy! You guys are reading his knife blog, right? Scott certainly knows his stuff when it comes to pocketknives, is a prolific writer, and can take a damn decent photo of his favorite steel subjects. Like I've said before in this space, I'm not even that into knives, but his blog is an entertaining one and I always learn something from it. Okay, Adrian was a no show, Scott had to do an about face upon arrival, so who was at the Hut? Well, Bobby M couldn't make it either. He was at a boat show in Ft. Lauderdale but will hopefully be in attendance next Saturday. Peter G was MIA as well. No Tom L either. But here's the rollcall: Joe K, Paul O, Ed B, and - winning the prize for traveling the farthest for a cigar - Mike G from Tennessee. Sorry, Scott, if you had stayed you would have won the prize! Yes, in a surprise visit, Mike arrived and it was just like old times at the Hut. Mike is actually in town to watch Vic's dog and take care of his nuts (Vic's nuts, not the dog's). Remember, Vic is the proud owner of a Nutty Bavarian Roasted Nut cart at a local flea market. Mike will be roasting up Vic's nuts and serving them up to customers while Vic is out of town. Mike regaled us with stories from the backwoods of Tennessee, from rattlesnakes, coyotes, and man-eating bears, oh my! And, of course, his own beloved pets through the years. Great to have you back, Mike. Hopefully you can visit again during your stay. Ed B has a bit of a reputation when it comes to food, specifically deli trays. Years ago at one of Lou's cigar tastings or open houses, Ed apparently made short order of the meat tray, and the legend has stuck. Well, around 4 o'clock, Mike was asking about various regulars at the Hut, including Ed. We said that Ed comes in now and then, and was here last week. Mike replied, "Call for a deli tray and he'll show up." Moments later, the mere mention of a deli platter is all it takes, because in walked Ed! Well, Don, I'll gladly buy you a cigar, but I don't know about giving up my chair! Time for a shameless plug. As many of you know, my wife Paula makes jewelry on the side. She has a booth next Saturday, Nov. 5th at the Arts & Crafts Show at the North Bay Community Church in Clearwater. It's at 3170 N. McMullen Booth Rd, between 580 and Curlew, across from Morton Plant Mease Hospital, between 9am-2pm. 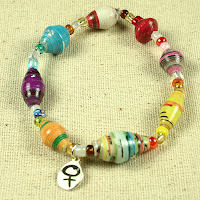 She'll be featuring her paper bead bracelets along with some other items. Most pieces are just $5 so please help spread the word. With the holidays coming, these make fantastic gifts! And, I've even created some of them to help her out. The beads themselves come from various third world countries like Uganda and Nicaragua and help the women who make them rise out of poverty. Finally, you may have noticed that the blog looks a little different. I posted a quick article a few days ago that I was experimenting with different color schemes, fonts, sizes, etc. Anyway, I'd welcome any feedback. Thanks!